Like most writers, I’ve always loved to read and even as an adult, I continued to enjoy reading picture books and middle-grade and YA novels, so when I decided to try my hand at writing, it only made sense for me to look to writing for kids. My first love has always been picture books, so I knew that is ultimately what I wanted to do. But I knew it would be a difficult market to break into, so I began by getting some magazine short stories and articles published and worked forward from there. I’m also a big nonfiction fan—especially when it comes to little known, quirky facts. So along my picture book writing journey, I’ve veered off onto a nonfiction writing trek as well. I’ve been blessed to have been able to write for many different markets. It’s challenging and fun and something new every day! 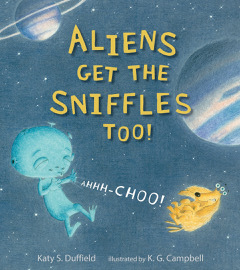 Congrats on your recent book, ALIENS GET THE SNIFFLES TOO. Tell us about it and what inspired you. One day, while considering new topics to explore, I thought it might be fun to have an alien character in a picture book. And, as writers, we know that our character needs to have a problem, so I began brainstorming ideas of what kinds of problems an alien might have—keeping the thought in mind that the problem should be a difficulty to which young readers could relate. Everyone has had to deal with the dreaded head cold, so I thought—what if an alien was sick? What would happen then? I pondered the similarities and differences between what an alien cold might feel like and what a human child would feel. The first lines popped into my head: “Little Alien was sick. And sick is extra-terrestrial bad when you have two throats, five ears, and three noses,” and the rest of the story flowed from there. An editor at Candlewick Press and an editor from another house both made offers on the manuscript in February 2012. After talking with both, I thought Candlewick would be the best fit for the book. It’s been more than five years since the initial offer, but I think the end result is worth the wait. K.G. Campbell’s art is—can I say it?—out of this world! Has your road to publication been long and windy, short and sweet, or something in between? As I mentioned, my publication route has definitely been long and winding. 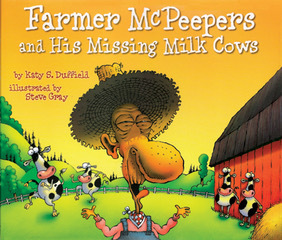 I wrote for magazines first, then had my first picture book published—FARMER MCPEEPERS AND HIS MISSING MILK COWS (illus. Steve Gray)—then ventured off into writing nonfiction books and for educational publishers. 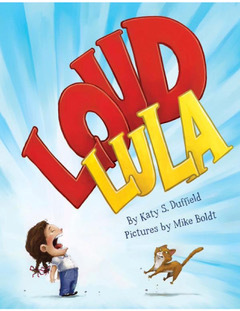 But all the while, I was continually reading and learning and writing more picture book manuscripts which led to the publications of LOUD LULA (illus. Mike Boldt) and, now, ALIENS GET THE SNIFFLES, TOO. We met through social media and the online kid lit community. How important do you think these have been in your creative journey? The online kid lit community has meant everything to me! When I first started writing in the late 1990s, there wasn’t a lot out there, but over time as the Internet and social media has taken off, a plethora of kid lit sites and blogs have sprung up. I met some of my very best friends in the world through the Blue Boards (now the SCBWI message boards). I joined a critique group of “Blue Boarders” and we’ve been together for 10+ years. I always say that kid lit people are the kindest, most giving people ever, and that is not hyperbole. I am so thankful to the many, many writers who have helped me over the years—giving advice, providing critiques, cheering me on, answering my questions, and patting my back/wiping my tears. I’ve tried to “give back” by responding to other writers. I hope I can help others as much as I’ve been helped over the years. Put God first in your life. Be kind to others. Give back. Work hard, persevere, and don’t let anyone tell you -you can’t. This is the advice I would give others and that I still give myself NOW. Katy is the award winning author of more than twenty-five children’s books including the picture books Farmer McPeepers and His Missing Milk Cows, illustrated by Steve Gray (Rising Moon Children’s Books), Loud Lula, illustrated by Mike Boldt (Two Lions, 2015), and Aliens Get the Sniffles, Too, illustrated by K.G. Campbell (Candlewick Press, 2017). 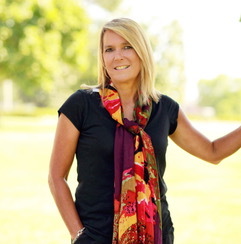 She has also written many nonfiction books for older readers, both fiction and nonfiction for many children’s magazines, and for several educational publishers. For more information on Katy and her writing, please visit her at www.katyduffield.com and follow her on Twitter at @KatyDuffield. Great info Katy, thanks for sharing! Can’t wait to read your latest! I didn't know, Katy, that you also wrote #NF. I love your pb's so I will go check out your nf's as well.! Good luck with this new book release. :) It looks delightful. Thanks to Sylvia Liu and all the Kidlit411-ers for allowing me to be a part of your wonderful website! The poor alien! I'd like to look at all of these books! Congratulations on your latest release, Katy! Thank you! Thank you, all! Great advice, Katy. Thanks for sharing your experiences and congratulations on your latest book. Thanks for the interview. This will be fun to read. I too share your advice for myself--I wish I'd put God first in my life from the start.